If It's Too Loud...: Ditch Mimes - Arise! Fitchburg, MA's Ditch Mimes aren't the typical music we cover here at If It's Too Loud..., but I feel the need to share this one with you. The duo, both college professors, play insanely loud music that's somewhere between metal and noise punk. Their latest album, Arise!, is a disturbing blast of pure noise and disturbance. The title track careens between these two sounds. Heavy metal riffs and metal growls but with the type of noise and chaos you only get in a band like Lightning Bolt. "Weird With a Beard" combines the crunchy guitars of Helmet with the sludge of The Melvins. "Charnel House" has a heavier Mudhoney feel. 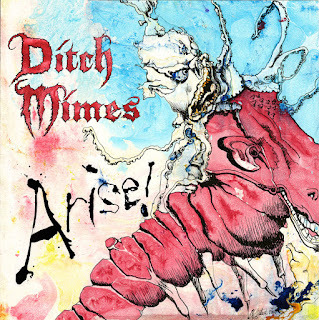 Ditch Mimes are perfect for anyone that loves the louder side of noise rock and the artsier side of metal. You can listen to "Arise!" below. You can pick up the album Arise! now at Ditch Mime's Bandcamp. For more on Ditch Mimes, check them out on Facebook.